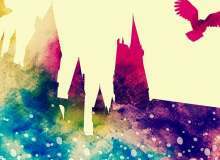 Are you a true Harry Potter fan? This part of the quiz and Part 2 will contain the questions, which will decide your fate as a fan. The questions gets harder as you go. This quiz might contain questions that want to make you laugh. Most of the questions in this Part 1 are easy, but the last question on Part 1 may stump you. Start doing the quiz! How many books are in Harry Potter series? Who is the main villian of the series? How many brothers does Ron Weasley have? What school does the hero go to? After the hero's parents were killed, who does the hero go to live with? Does Ron have a pet? Who is the new Defense Against Dark Arts teacher? Theory Question: Is Dumbledore Death? The author says it fits, so yes. No: It does not fit.